Article: Why I Chose To Work With FasterEFT By Mia Doucet. Before exploring the differences between Classic EFT (which I originally studied) and Faster EFT, I want to make it clear to you that, although my personal preference is Faster EFT, I have immense respect for EFT and all other energy therapies and their practitioners. I also have immense respect for the people who blazed the trails along the way for Robert G. Smith, founder of Faster-EFT: Dr. Roger Callahan (TFT), Gary Craig (EFT), Dr. Larry Nims (BSFF), Richard Bandler and John Grinder (NLP) who codified the work of Dr. Milton H. Erickson. There. Now that this is out of the way, let’s look at what the two modalities have in common. On the surface, EFT and FasterEFT appear to have much in common. But in fact, each method approaches tapping and healing from a totally different mindset or perspective. According to EFT, memories may contribute but are not the cause of the negative emotions. The Faster eft meridian points" cause is the emotional charge or disruption. When the energy system is disrupted, we experience physical, mental or emotional symptoms. Essence of FasterEFT in a Nutshell Robert’s FasterEFT system operates from the belief that there is no disruption in the energy system. In fact, he says, that is physically impossible because if our energy were blocked with a negative emotion such as anger for example, we would be stuck with anger. But, if in the next moment we can experience a positive emotion such as love for a small baby, then obviously the meridian isn’t blocked. “It is not a disruption but a creation. It’s about subconscious imprints recorded in the brain in childhood and our emotional attachments to what we have perceived.” ~ Robert G. Smith, Founder, FasterEFT. EFT believes that “Your energy system is a set of electrical circuits and psychological reversal is ‘like your batteries are in backwards.’” So in order for the rest of the process to work, you have to take care of any interfering energy blockages in the system by setting up the tapping with an “even though” statement or affirmation (said three times while tapping on the Karate Chop point or the sore spot). The source of our problems, he says, is birth! From the moment of birth (indeed, from the moment of conception) we’re recording our experiences of the world as subconscious imprints in the brain. We have problems because we were born into a world where the people around us had problems, and we learned how to cope . . . from them. The real cause of all our problems is perception, meaning that we see and interpret what’s happening to us now through the filters and recorded information from our past. We “know” how to interpret and deal with what’s happening to us now based on what we learned from past memories and references. The past does not exist . . . it’s over. However our past seems real to us because of the emotional charge that is still present when we remember things. The future likewise doesn’t exist, except that we take our emotional programming from our past experiences and project it onto the future. Nothing is real except the present moment. All else is re-creation, based on what is in the subconscious mind. While EFT treats physical, mental and emotional symptoms as a disruption in the energy system, FasterEFT treats these symptoms as a skillful creation of the subconscious mind. We’re doing something right in order to create and re- create an emotion over and over again. We’re doing something right in order to have a problem and in order to keep producing it. If we’re doing something right, then we are not broken, we are skillful. If our subconscious is the cause of our own problems, then we can address the whole subconscious system that produced those problems. Here we see the influence of Dr. Fred Gallo and BSFF. Our task as Faster EFT practitioners is to figure out what people are doing inside their mind to create, manifest and produce the problem. I’ll have more to say about that in the discussion of the role of NLP (next up). “Stress is the body’s reaction to negative perceptions.” Since the mind and the body are one, our thoughts manifest as symptoms or emotions in the physical body. Whatever we think, our body naturally follows. It’s the physical manifestation that makes it seem real. This means that at any moment, you and I can create sadness or anger if we know how. We just have to think a sad or angry thought. Our mind will trigger our body and make it seem real somewhere in the body. Now get this . . . Where EFT says that our problems are caused by an energy disruption, FasterEFT says what we want to do is create a disruption in the communication system. We want to temporarily disrupt the message of stress from reaching the body. When we create a disruption, then we create changes. 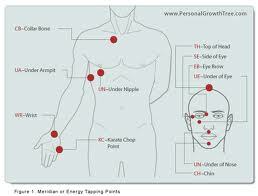 So the tapping actually breaks the pattern that has been creating chaos in the body’s central nervous system. This causes a positive mind/body shift. So, the Faster EFT emphasis is on the structure of the thinking and the structure of the problem itself. How does the person internally represent and hold in memory the things that happened in his past? How does she process thoughts and memories (visual, kinesthetic, auditory) of the things that happened to her? And how do they repress or replay them in their minds? What are they doing inside their mind to keep past memories alive and make them seem real today? 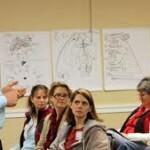 When we step into a person’s mind using the skills taught in NLP, we start to understand how they produce their world. And once we are able to access these internal states of mind it’s easier to make the desired changes. When we’re feeling bad, we’re slipping out of the present tense and into that old, familiar, negative hypnotic state or trance. It takes no effort at all to get there. Our unconscious takes over. That’s how we keep the past alive. As Robert says, “memories buried alive never die.” (Until you aim at them and tap them away, of course.) When you look at Robert’s FasterEFT videos on YouTube you can actually see the client go into a hypnotic trance. Sometimes their eyes glaze over as the person relives a past experience. It’s like a past event has come alive again, in the present moment. You can see the emotion in their face and eyes and their whole physiology changes. Whenever we are not fully engaged right here in the present, we are in a trance. This is why Robert says, “When you remember something from the past and it causes you pain, it’s now you doing it to you.” The effective practitioner is pulling the person in and out of the trance state. Into the trance, then back into the moment, into the trance, then back into the present moment. 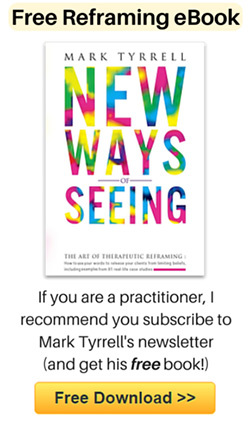 Each time this happens, the practitioner is allowed deeper access to the client’s subconscious model of the world, where they can pull out interlocking threads. Tapping works, no matter who does it, because it addresses the mind/body system via electrical impulses that travel along the meridian system. BUT HOW? Viewed from their two very different perspectives, tapping is effective for very different reasons. EFT uses tapping to remove “static” from your electrical system. I think the EFT practitioner might say that the most powerful part of EFT is the tapping and the words that accompany the tapping. Not so with FasterEFT. Faster eft pain,weight loss, fear, anxiety, etc F-EFT believes you get quicker results when you incorporate NLP understandings of how the mind works with the tapping. Knowing how a person encodes and processes information through their five senses and working with the way that information is encoded and communicated makes deep, deep changes. For example, rather than searching for the right words to use, or labeling the feelings, FasterEFT will tell the client, “Go inside and notice how you know that you have a problem,” and then we tap. Notice that we allowing the client’s subconscious mind to do all of the work, and we are tapping at subconscious structure or process rather than content. In terms of FasterEFT, tapping doesn’t make sense until you know that problems are created within us, based on our body’s reactions. Once we understand the structure of a problem, we can change it. FasterEFT Meridian tapping is one (and one extremely effective) way to do it. Tapping just happens to make changes faster, deeper and quicker than other methods. As you can imagine, this creates changes at a deep, unconscious, cellular level. FasterEFT maintains that tapping breaks bad trances and creates a new trance of peace. The effectiveness of the tapping depends on the person and the depth of their trance. Some people get right into it. Others need to be prompted to move into their internal process. 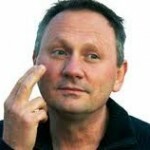 Difference between FasterEFT and Traditional EFT acts differently - The evolution of EFT is Faster EFT. 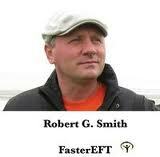 Over the years many people have added pieces to the EFT tapping system but Robert Gene Smith added more to the system and brought it to a higher, more efficient level. “Psychological reversal is caused by self-defeating, negative thinking which often occurs subconsciously and thus outside of your awareness.” ~ Gary Craig, Founder, EFT. And if there is no psychological reversal there is no need to make up statements for tapping to be effective. Faster EFT focuses on disrupting the brain’s repetitive patterns of reconstructing and replaying negative memories and sensations, thereby keeping them alive. EFT psychological reversal affirmations look clumsy by comparison. Their elimination makes FasterEFT cleaner and . . . well . . . faster. The word that comes to mind is streamlined. Perhaps you will agree. No matter which modality we’re working with, we have to address the emotions. They are the juice behind the memories and they are what make memories seem real. Emotions drive our behavior without our consciously knowing why we act the way we do. If you know anything about tapping you know that if you don’t aim the tapping at an emotion, you can tap until the cows come home and nothing will change. After all, the inability to deal with emotions lies at the heart of all the matters we work with, from addictions to Post Traumatic Stress Disorder to an endless list of lifelong themes such as abandonment, struggle and betrayal. EFT requires you to identify and name specific emotions and treat them as separate aspects of a memory. If we fail to do that, we will not succeed in erasing the negative experience. With FasterEFT, there is no need to be precise and no need to name the emotion. FasterEFT aims at collapsing the entire program of the memory (how a person recorded and replays an event over and over). That way, we capture all aspects at one time. FasterEFT asks you to notice what you are doing inside your mind to produce the feelings and feel the emotions while you tap. Just follow the emotions and the physical sensations. You don’t need to know where they came from or who gave them to you. That is, you don’t necessarily have to find the “root cause event.” All you have to do is have the client “notice how they know that they have a problem.” (This pulls them into trance.) And then your tapping aims at the structure or process of the problem. You’d say to the client, “Let the feeling bother you, and then notice how you know it bothers you.” Then tap and say, “Let it go.” “Let go of everything that supports this memory or feeling.” How great is that? The FasterEFT practitioner might tell you to notice what you’re doing in your mind. They might say, “What do you have to think about in order to get this feeling or create this problem?" How do you know you feel afraid? Where do you feel it in your body? Do you have a tightness in your stomach or your throat or your heart?” These questions are asking you to recall your experiences in the way you recorded them in memory. What is your perception? What are you doing inside your head to make the problem real? That way, we can aim directly at the problem and its creation. With FasterEFT’s Super Power TapTM, you can stack memories and negative emotions and let the unconscious mind do the work of collapsing all of them in one fell swoop. Again, you can see the ease and simplicity of this method. 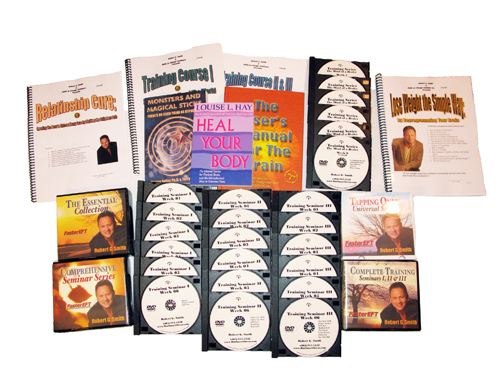 Almost all of my clients are already familiar with EFT by the time they contact me. They have used the EFT or FasterEFT process on themselves, are more or less convinced that it works, but haven’t achieved the success they were hoping for. They often tell me they don’t know what to say when tapping. As though there is some sort of magic in saying the right words or having the right script. In fact, my EFT training told me that the words you use while tapping are important. When I was practicing EFT and working with a client who could not describe what she was feeling, I would refer her to a full page list of emotional feeling words to help her pinpoint the emotion. With FasterEFT, what is important is tapping to let go of the emotion you feel as you recall and replay a memory. There is no need to make up statements for tapping to be effective. You can say, “Whatever this emotion is.” “Whatever it means or represents.” “Wherever it comes from.” “Whatever it attaches to.” From the standpoint of the practitioner, it’s a simpler process again because there are no scripts to commit to memory. With EFT, you need a specific target to work on in order to be most effective: a specific conflict, event, symptom, or emotion. Not being specific enough and not addressing all parts or aspects of the problem are considered major mistakes. As mentioned above, with FasterEFT you do not need to focus on specifics. There is no need to be precise. You as the practitioner don’t even need to know how the problem started or where it came from. What is important is that the client notices how they know they have the problem. Because you’re aiming at what the mind/body is doing internally to produce the emotion right now. Again, F-EFT aims at the entire program that the mind has created. It’s not a matter of clearing an energy blockage on a specific part or aspect of an issue. Do you know because you’re having a non-stop conversation in your head about it? Are the words you say to yourself your own or someone else’s? Do you know because you feel a sensation in your body? Is there a specific location? Is it an ache? A pain? Is it pressure in your chest? How big is it? Like a bulldog, the practitioner keeps asking the client to try to get the problem or feeling or memory back. Then we tap away every avenue the subconscious mind had for being able to create the problem. We do this over and over again until there is nothing left of the structure of the problem . . . no emotions, no triggers, no discomfort. There is strong use of Robert’s TOTEMS model in this system. (TOTEMS stands for Test, Operate, Test, Exit, Make it come back, Switch it.) In FasterEFT, “Switch it” or “Flip it” means “Reimprint it.” Speaking of which . . . The reimprinting process is a key aspect of the Faster EFT protocol, and this piece was missing in Classic EFT. Once we have disrupted and changed all of the ways that a client used to be able to create a problem, and once we have neutralized all of the bad feelings associated with a memory, we are then able to “Flip” a memory. Flipping means that we literally change what was happening in a memory so that, when we think about it again, it feels good and positive. One way we accomplish this is by changing the facial expressions of the various parties in the memory. Another way would be to send love and understanding back to the younger “you” in the memory. By reimprinting memories, we change the past and create new possibilities for the future. Many EFT practitioners combine EFT with chakras, auras, hypnosis, healing the inner child and Matrix Reimprinting, among other modalities. But it seems to me that, since Gary Craig’s retirement in 2010, there have been all sorts of changes and additions to the EFT process and protocol and certification training (without his endorsement and to his dismay). So the practice of EFT is changing and evolving. What I have written about here are the differences I see at this time. One Last Word In closing, I want to say that FasterEFT is not a rejection of Gary Craig’s work. Not in the least. It is an evolutionary leap. EFT and Faster EFT are precious, precious gifts to the world. Where Gary paid Callahan $10,000 for the original Callaghan Techniques training and $100,000 for his Voice Technology secret that would allow a practitioner to do the work over the phone (Roger’s view is that what is going on in the energy system is encoded in the voice) you and I get to watch and learn life- changing technologies from Robert Smith’s YouTube videos for free. Can you think of a greater gift than this? Special Thanks I want to express my thanks to Eric B. Robins, MD Urologist and Surgeon, for his generosity in reading the final manuscript of this article and making several valuable suggestions. END NOTES: 1Note #1: To make for easier, faster reading, I have used the acronyms: EFT (Emotional Freedom Techniques), FEFT (FasterEFT) (Faster Emotionally Focused Transformations), BSFF (Be Set Free Fast: “Behavioral & Emotional Symptom Elimination Training For Resolving Excess Emotion: Fear, Anger, Sadness & Trauma.”), NLP (Neuro-Linguistic Programming), and TFT (Thought Field Therapy). “BE SET FREE FASTSM [BSFF] is a highly focused Energy Therapy method for eliminating the emotional roots and self-limiting belief systems that are embedded in the subconscious mind, and which automatically determine and control most of our experience, self-expression and behavior. These unresolved negative emotions and beliefs create and maintain psychological and physical symptoms, which automatically result in mental, emotional, physical, energetic spiritual and life adjustment problems, including many medical, and health problems. BSFF eliminates these subconscious programs quickly and gently. BE SET FREE FASTSM is a descriptive acronym for “Behavioral & Emotional Symptom Elimination Training For Resolving Excess Emotion: Fear, Anger, Sadness & Trauma.” iv An excellent book on the topic is “The Brain That Changes Itself” by Norman Doidge, M.D. That’s the sort of pluck that Dr. Roger Callahan, founder of Thought Field Therapy (TFT) required in order to break with traditional psychotherapy. He was the brains behind combining Applied Kinesiology and acupuncture with his knowledge of the human mind to make groundbreaking strides in the world of energy psychology. It’s the courage EFT’s founder, Gary Craig, needed to break with Dr. Callahan’s elaborate procedure of muscle testing. As a scientist (Gary was a Stanford-trained engineer) he questioned the need for Roger’s algorithms to diagnose which meridians to tap for specific emotions and streamlined the system to tapping on 14 meridians in all situations. He also found that the order in which you tap the points is not important. It’s the audacity Robert Smith showed in breaking with the 4,000 year old paradigm of traditional Chinese Medicine which claims that pain is caused by a blockage in the flow of life energy. Positive affirmations with the end to let emotions go or try to get rid of emotions has one problem in that you are putting energy into getting rid of them, and you are not first accepting the emotions. The inovator of the yes program insists you should focus on saying yes to the bad feelings rather than get rid of them because in saying yes they naturally dissolve without trying or intending to get rid of them.